The Avro Lancaster is the most famous of the British WW2 Heavy Bombers, it was developed designed by a team led by Roy Chadwick from the existing twin engine, under-powered, Avro Manchester. The prototype Avro Lancaster first flew on the 9th of January 1941 and it's first operational sortie with the RAF in it's original BI guise took place during mid 1942. By the end of Lancaster production, a total of 7,377 aircraft had been built in Britain and Canada. It is of note that the Avro Lancaster was the delivery system of Barnes Wallis's 1944 super-sonic 12,000-lb Tallboy bomb used in Operation Crossbow against the VI underground factories, and the 22,000-lb Grand Slam "earthquake" bomb successfully used against German U-boat pens protected by 23 feet of reinforced concrete. 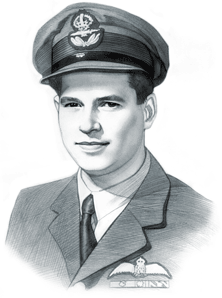 The best known Barnes Wallis designed bomb for the Lancaster bomber was the famous "Bouncing Bomb" used in the attack on the Ruhr dams Mohne and Eder during May 1943, the mission was led by Wing Commander Guy Gibson (pictured below) who received the Victoria Cross as a result of this raid, later immortalised by the film "Dambusters". The Avro Lancaster B1 PA474 pictured above was built in 1945 and stared in the film ‘The Guns of Navarone’, it joined the RAF's BBMF ‘Battle of Britain Memorial Flight’ in November 1973 and is the only British built Avro Lancaster still flying (one Canadian built Avro Lancaster MkX also remains airworthy). During WW2 Avro Lancasters dropped 608,612 tons of high explosives and in excess of 51 million incendiaries with an average combat life expectancy of approximately 21 sorties per aircraft (about 160 hours mission flight hours). 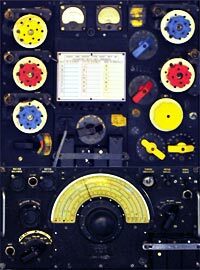 The R1155 aircraft communications receiver, and it's associated T1154 transmitter, were developed from a Marconi design for RAF use in it's medium and heavy bomber aircraft. One early notable problem with the R1155 super-heterodyne radio communications receiver proved to be the unwanted reception of Radio Athlone, a Republic of Ireland national radio station, this could make the reception of any other signal impossible at some locations, this was due to the radios 560 khz intermediate frequency being the same as the radio stations transmitting frequency resulting in RF breakthrough in the IF stage. The problem proved sufficiently serious to require two special "Athlone" filters to be designed and fitted. These pictures of an Avro Lancaster B I Bomber are Copyright © June 2014 Siteseen Ltd. We only authorise non-commercial picture use and particularly encourage their use for educational purposes. These Avro Lancaster B I Bomber pictures are not in the Public Domain. 2) For internet use, no more than three individual pictures shall be used on any given website and a link back to this site must be provided for every picture used. 3) Use of thse Avro Lancaster B I Bomber pictures, or any of our pictures on websites re-distributing copyright free material is strictly prohibited.